Writing can be viewed as something of a bad habit, by me at least. It takes up a lot of time in the doing and it takes up even more time in the thinking-about and the plotting and general mulling-over. Lawns don’t get mowed, cars don’t get washed, cobwebs remain largely unchallenged and the tangible rewards are singularly meagre, except in the case of a daring and talented few. The writer embarks upon a course that, unless he/she is very careful, will result in a dotage spent wandering through a spider-ridden house, with tonnes of paper stacked high in every room and no visible means of support. That’s why, when I use the word’ Enabling’ in the title, I’m thinking of the slightly negative connotation as well as the positive one. When someone enables you in writing they are encouraging you and providing you with resources and creative shelter. But it’s also like you’re a smoker and they’re holding the door open for you and handing you a box of matches. Enough whimsy. All I really want to do this week is to acknowledge the part that the Linenhall Arts Centre has played in keeping me thinking of myself as a sort-of-a writer and in making me better in that regard. The Linenhall has been doing this for me for the last fifteen years or so, pretty much ever since I first came from London to live and settle in Castlebar. Before that, there were other ‘Enablers’ – good folk who quietly provided me with kindling for my writing spark. There was my English teacher in school, Patricia O’Higgins, who quietly slipped me books that were out of my comfort zone and who, when I was getting ready to leave for Dublin at the tender age of sixteen, told me how, ‘it would be good for my writing’. The instillation of the idea that I might have something called ‘writing’ was a key moment in the confirmation of my lifelong passion. Then there was Independent Radio Drama Productions. Marja Giejgo and Tim Crook gave me my first break in radio and continued from there right up to today in quietly affirming that I could righteously consider myself to be a writer, even though I’ve never quite managed to do that. Apart from the radio productions with IRDP, Tim and Marja also allowed me to be a script reader for a number of writing competitions. I would receive bundles of radio scripts in the post, thirty at a time, and would pare them down to the best two. It wasn’t hard. The best ones always shone so brightly that anyone could have seen them. The invaluable lesson was not found in perusing the top two but in examining the other twenty eight. Each had to have a little review written and I took some care with those, trying to explain why, to my mind, the script had not made the grade. Seeing things that should not be done being done over and over again taught me something. I’m not sure what, exactly, but it’s in there nestling all the time. When I arrived in Castlebar, I was a little cast adrift from anything that might anchor me to my writing. Luckily, I’ve always had the drive to be writing, even when there was no logical reason to be doing so. Somehow, I blipped on The Linenhall’s radar and they’ve been subtly looking out for me ever since. I have come to be a person who likes to share the writing I do. If I did not have a facility to do this, I would still write but it would be a less satisfying, more closeted, sort of writing. What the Linenhall have done, among many, many other things is allow me to avail of their facilities. They have a lovely theatre with all the lights and all the sound and all the space that a person like me could wish for. Through their auspices, I get to avail of all this stuff. If there’s a play, I get to take it in to the theatre space and, with the help of good people, work it up and mould it and make it more ready to be shown. That’s only the start of what they do for me at The Linenhall but much of it is almost too subtle to pin down in a coherent sentence. They… make me feel like a creative person. I think that’s it. Of course I am a creative person, at least by some definition. I take a blank sheet of paper and, for better or worse, I make a play and then actors come and bring the play to life. So, from nothing there comes something and that, I guess, is what you might call creative. I can drag myself for enough to say that I am creative but I will never think of myself as an ‘artist’ or anything as far reaching as that. I am, at most, a storyteller, a mouthpiece, a bit-of-a-wag. And the Linenhall give me room to be all that and they do it with a constant smile and a gentle nudge in the right direction, which is unerringly forward. I feel so lucky to have this. Sometimes I feel like David Mamet (although I could not tie his shoelaces). Like him, I can grow my play in a small theatre setting, show it, improve it, and send it out into the wide world to see where, if anywhere, it may go. I won’t ever be a world-beater but the little plays conceived and grown in-and-around The Linenhall had gone on to play further afield and to people who don’t know who I am. I like that. This time next week, we’ll be in the run-in to my newest play at The Linenhall. 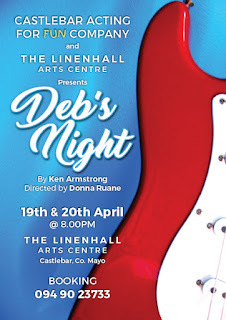 ‘Deb’s Night’ is directed by my good friend Donna Ruane and features a superb teen cast of eighteen. Yesterday afternoon, I sat and watched the rehearsal. The drive, the intensity of trying to get it right. You couldn’t buy it, not with a million bucks. I hope it plays well to the audiences who will come. There is drama in there and humour and some feeling. Let’s see how we go. I am a lucky duck to have The Linenhall Arts Centre in my life. I have deliberately refrained from naming everybody in there because you are all my valued friends but I’m not writing about you today. I’m writing about what you collectively become when you do your work for the Artists and for The Community and for the old Writing Wags too. Enabling is one thing, being able something else. Carrie enables me. For the last ten years I haven’t had to work and I couldn’t do that if she hadn’t told me it was okay not to feel I had to be the breadwinner. It took me a long time to get used to that and to be honest I’m still not that comfortable with being a kept man. But it enables me to write even if the writing makes no money, even if the writing loses us money. Only I don’t write. At least I don’t write as much as I think I should. And that bothers me. I don’t have a lawn to mow, a car to wash and I’m mostly oblivious to spiders’ webs. Most writers are like you, they have to hold down a full-time job and write in their spare time. All I have is spare time and yet I can’t write. I can edit and I enjoy editing and I’ve enough material that needs attention to keep me going for the next four years easily but I’m not producing new stuff. One poem in the last two years. I’ve tried to start three novels but dried up after a few pages. So I make no bones about it, I’m jealous of you. I’m pleased for you—dead pleased—but I’m also jealous. As to whether you’re an ‘artist’ or not all I can say is Isaac Asimov never thought of himself as anything more than a storyteller—he had no ego in that respect—and things worked out not too bad for him. I sometimes wish I was one too but that’s not what drives my writing. I’m a problem solver and at the moment the only problem I have is not having any real problems. As I said I have no lawns to mow, no cars to wash, no issues with any of my arachnoid house guests and no burning reason to put pen to paper.